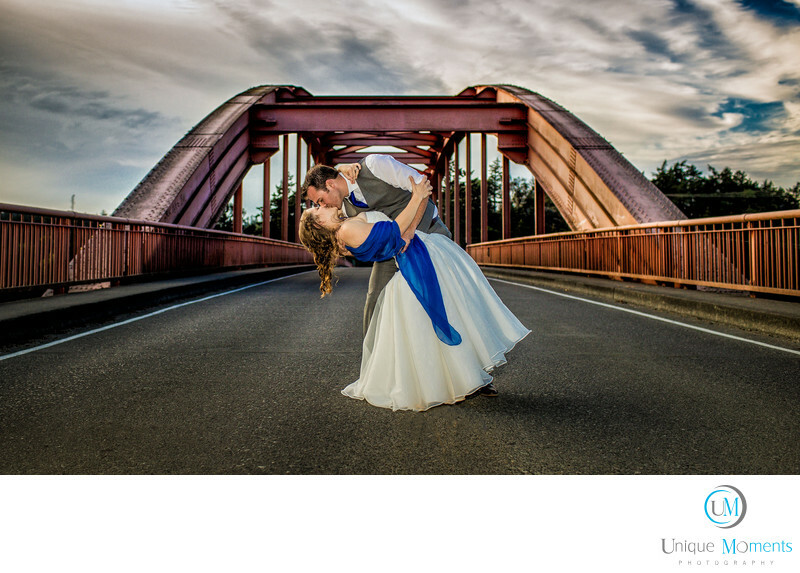 Unique Moments Photography from Gig Harbor Washington had the honor to capture Jeni and Jordan’s Awesome wedding at Pioneer Park in La Conner Washington. When you think of La Conner, the Skagit Tulip fields and festival comes to mind as well as the beautiful sea side town of La Conner. So when Jeni contacted us about the wedding in August, we were more than a little excited for this one. We Knew it was going to be special. We normally do not photograph a wedding unless we do an engagement session with the couple. But family and friends were flying in from all over the country for this wedding, jeni was in the middle of her residency programs and there was no way to get an engagement session in before the wedding date. But this was one wedding that we did not want to miss. Jeni and Jordan made great plans for their wedding. The first look was at Bowman Bay in Deception Pass State Park which was about 20 minutes from the wedding location. She could not have picked a more perfect place for photos and their first look. Bowman Bay is simply spectacular. After their first look, family formals and bridal party photos also took place at the bay. It was such a beautiful sunny day. Could not have been any better for an August wedding in Washington. Then it was off to Pioneer park for the ceremony. Wow, we were impressed. Pioneer park is a great place to have a wedding.The have a little outdoor theater with a covered awning. Plenty of room for all the guests and the theater over looks the water way to the town of la Conner. Tons of shade, 200Ft tall trees. Just a beautiful pace to get married. Plus you can cater in your own food and the park has a covered area for guests to eat and to have a reception at as well. We thought it was perfect. Jeni and Jordan had a wonderful ceremony and the reception was a blast as well. The guests were treated to an outstanding dinner with some of the best Pies I have ever tasted. So Long Marie calendars. You have been officially replaced. Reception activities included speeches from best man and maid of Honor, father daughter dance, mom son dance and of course Jeni and Jordan had their first dance as well. As the sun dropped in the sky, we went out for some fun pictures with the bride and groom and finished the night with everyone dancing and having a great time. This was an awesome wedding. Family and friends Invaded the town of La Conner from all over the country. The support that Jeni and Jordan have from their family and friends was really great to see. This one was special and it was simply an Honor to be part of this family for the day. Congratulations to the couple and these wonderful families. Location: 1200 S 4th St, La Conner, WA 98527.